The Gasteinertal is a 40 kilometres long valley in the Alpine south of the Austrian province of Salzburg. It has been populated since Celtic and Roman times, even though the Gasteinertal used to be a "dead end" until the construction of the Tauerntunnel in the 20th century. The Romans were the first to discover gold and silver in the Gasteinertal and mining was an important business there ever since, to cease only in the 20th century. Another important business throughout the centuries was trade and transportation, since the Gasteinertal and the mountains to its south connect (or separate) Italy and Central Europe. This is also why the Tauerntunnel was built despite of high costs - as you would imagine for the construction of a 4,200 metre long tunnel trough rock. The Gasteinertal is very touristy and famous for four things: Skiing (winter), hiking (summer), its hot springs / thermal spas (all year round) and the fin de siecle atmosphere and casino of Bad Gastein (during the tourist season). There are three towns in the Gasteinertal: Bad Gastein, Bad Hofgastein (the traditional "capital) and Dorfgastein, each one with several hamlets. The town of Bad Gastein became one of Europe′s most exclusive spa towns in the late 19th century and is still full of fin de siecle hotels - many of them are now empty. With the construction of a railway through the Gasteinertal in 1909, Bad Gastein was finally opened to modern mass tourism - but still of a very exclusive kind. 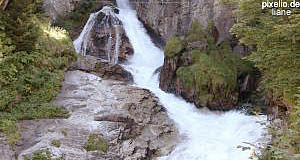 Bad Gastein is also where most hot springs originate. The water of these springs is rich in the radioactive gas Radon - a fact that was determined by double-Nobel laureate Marie Curie. Please note that I have already written a separate article for Bad Gastein and won′t go into further detail. Let′s finish the history of the Gasteinertal: Once the Roman Empire had fallen, Bavarian tribes populated the Gasteinertal and in 1218, it became part of the Duchy of Bavaria. In 1297, Bavaria sold it to the Archdiocese of Salzburg, where it remained until today - after the secularisation of Salzburg in the 19th century as part of the Austrian federal province. There are indications in a poem from 1230 that the springs of Bad Gastein were already used by then - there is definite evidence for organised bath action after 1350. Soon, something like a late Medieval and Renaissance spa culture developed, with celebrity visitors such as Emperor Friedrich III or the doctor and alchemist Paracelsus in the 15th and 16th century respectively. The late Middle Ages and early Modern days were also socially difficult - Protestant ideas and social unrest among the miners resulted in several revolts and many miners from the Gasteinertal participated in the peasant wars. This was also partly due to a falling price for gold and silver. In the 19th century, tourism gradually became more important for the Gasteinertal than mining, and famous visitors of the spa towns included Emperor Franz Josef I, his wife Empress Elisabeth and the German Emperor Wilhelm as well as his chancellor Bismarck. Mountain enthusiast Archduke Johann invested a lot of money into the construction of hiking facilities such as cabins and paths. With the construction of a railway link in 1909, the already popular valley became even more accessible for all sorts of aristocrats from Munich, Vienna and other big cities (see also my article on 19th century anti-Semitism in Austrian spa towns). Alas, with mass tourism the "quality" of guests decreased and the need for high-end hotels dropped. After WWII, ski lifts and other skiing facilities were developed and with the organisation of the World Championship in Skiing in 1958 in Bad Gastein, the Gasteinertal was finally established as a two-season destination. Many of the posh hotels from around 1900 are now empty or put to alternative uses - such as the casino in Bad Gastein. In addition, modern spa hotels and sport hotels were built, usually outside of the traditional centres. Today, the Gasteinertal offers a wide range of facilities to accommodate all sorts of tourists: Lots of convention and business meeting venues, golf courses, the famous spas (there is an eight kilometre long pipeline from Bad Gastein to Bad Hofgastein that transports the hot water since 1830), the Heilstollen (former mines that contain air that is rich in Radon, which is said to be good for all sorts of health issues), the mountain biking and hiking opportunities, as well as other - more unusual - summer sports. The most important sightseeing attractions include the St. Rupertus Kirche in Dorfgastein, the ruined castle Burg Klammstein (which dates back to the 12th century), the church "Zu unserer lieben Frau" in Bad Hofgastein, the Weitmoserschloss (a Medieval manor that was strongly altered in the 19th century), the Nikolauskirche Church, a church in Böckstein, the Gasteiner Museum (a folk museum dedicated to the vally - good starting point, actually), the Montanmuseum (museum of mining) - and of course the casino and town centre of Bad Gastein.